Open a Calc document and firstly check if the 'format paintbrush' paint brush icon is on the standard toolbar. Click on the down arrow on the bar at the end of the standard toolbar and from the Drop down > click Visible Buttons > find the icon for 'format paintbrush' and click on it to make it active on the toolbar. With the (coloured) Cell selected > double click the 'format paintbrush' icon on the toolbar. The cursor will change to a paint pot pouring paint. Select any cell on the spreadsheet > left click to add the colour. 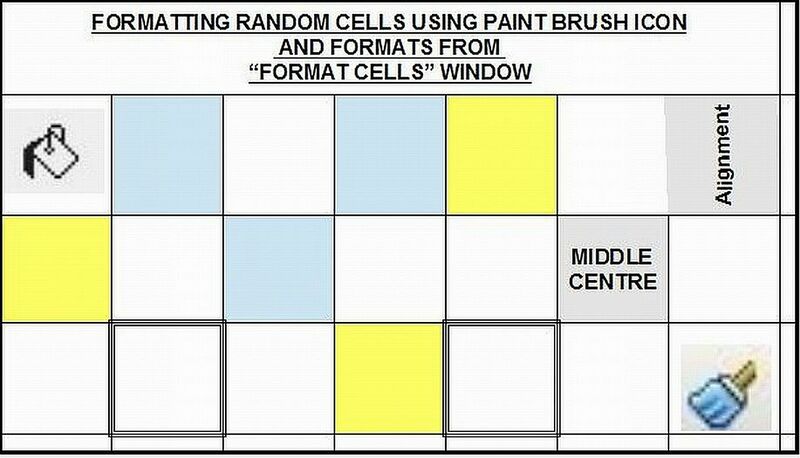 This action may be repeated to choose another colour to add to various other cells in the Calc document. Press the Escape key or double click the format paintbrush icon to return to working on the spreadsheet. The colour may be added to a cell before or after text has been written in the cell. Any of the formatting options in the Format Cell Window can also be applied to the original cell formatting such as Borders, Font, Font Effects, Alignment etc and will be carried over to other cells when the format paintbrush is used. Text can be selected using the mouse in various ways which makes the text become highlighted (this is an example of highlighted text). the highlighted text can be copied and pasted to another part of the document or between one application and another or copy and move files and directories from one location to another. Any amount of text may be selected from a character, a word, a line, a paragraph, a page or even a whole document. To select any amount of text, drag the cursor I-beam across the required text. Dragging means to hold down the left mouse button whilst moving the I-bar across text. One of the handiest functions on computers is learning the shortcuts to copy and paste text quickly and easily. Keyboard shortcuts make the going easier, rather than taking the longer method of menu navigation (Edit and from the Drop Down menu > Copy) or right clicking after highlighting text and clicking on Copy in the menu that comes up. The shortcuts in Windows-style keyboards use the Control (Ctrl) key in combination with the 'C' key to copy. To begin, place the cursor (I beam) at the beginning of the text you wish to copy, then hold down the left mouse button and drag the cursor across the text to highlight it. You can drag it downwards to cover multiple sentences or paragraphs if need be. Let up on the mouse button when you’ve reached the end of the text you want to copy. If it is necessary to highlight more text than is visible on a single page, place the cursor at the beginning of the desire text, click once and let go, then scroll down to the end of the desired text, hold down the Shift key and click the mouse at the end point. All text between the two clicked points will highlight automatically. A word: Double-click the word. A sentence of text: Treble-click a word in the sentence. Multiple lines of text Move the pointer to the left of the lines and then drag up or down. (Remember to keep the left mouse button down until you are at the end of the text to be highlighted. A block of text: Place the cursor at the beginning and then click at the end of the block while holding down the Shift key. Multiple blocks of text: Click and drag, hold down the Ctrl key while selecting extra blocks. Place the I beam at the beginning or the end of a word and hold the shift key down on the keyboard move to the left or right of the insertion point by moving the left and right arrows on the keyboard or the up and down arrows to move up and down. Complete document: CTRL+A or Edit > Select All. To de-select any highlighted text click anywhere on the screen outside the selected area. Windows has a feature called the Windows Clipboard. The clipboard gives Windows users the ability to store information in memory and then retrieve that information for later use. The copy and paste functions rely on the clipboard in order to work. The process of placing data into the clipboard is known as copying. The process of retrieving the data from that clipboard and placing it into another location is called pasting. It is important to understand that the clipboard is used to contain the data that you want to paste into another location. If there is no information contained in the clipboard, then you will not be able to paste anything. Any data that is stored in the clipboard via a copy command will stay there until it is overwritten by another copy command. When data from the clipboard is pasted, the data is not removed from the clipboard, and can be pasted over and over as many times as wish. The data in the clipboard will be erased, though, when you copy something else to the clipboard or shut down or restart your computer. Paste means to place information from the Clipboard into another document, or the same document, by retrieving that information from the clipboard. Simply move your cursor to the location where you would like the data to be pasted into your document and then choose one of the methods for pasting the data. Right-clicking on the document and from the menu drop down click on Paste. From the Edit menu > click on Paste. After you use one of the above commands the data contained in the clip board will now be pasted into the document. This action can be repeated as many times as required until another word, block of text, or file is copied to the Clipboard. It is also possible to use the same key combinations and commands on files and folder. Simply select a file(s) or folder(s) and copy it. Then you can select another location to paste it to. Knowing how to copy and paste text and files from one location to another is a powerful tool, to move information around in your document or to take information from another document and paste it into another document. This includes the ability copy files and folders from one location and place them into another location. Using the short cut keys of Ctrl plus C to copy and Ctrl plus V to paste adds to this valuable function on the computer. When using an Open Office Calc Spreadsheet additional rows or columns can be inserted by > Insert > and from the Drop Down > Row (or Column). This action can be repeated to insert as many rows or columns as needed. Alternatively rows and columns can be added by clicking on the icons on the Tool Bar. Beside the name – Visible Buttons is a side arrow which will show a list of icons and the name of their function that could be on this toolbar. The icons that are already displayed on the toolbar will be shown by a grey background to the icon. Click on any of the icons not already greyed to add them to the toolbar. Click on the 'Insert Rows' 'Insert Columns' 'Delete Row' 'Delete Columns' to add them. These will prove very helpful if using Calc regularly. To add multiple rows to a Calc sheet select multiple rows where you want the new rows to be. Click the row at one end of the range and Shift+click the row at the other. Then Insert Rows will replace all those rows with new empty ones, moving existing rows down. Clicking once on the icon on the tool bar. Additional columns may be added in the same way by using Insert Columns for as many extra columns are needed. Do you find the margin border in Openoffice Writer annoying and want to get rid of it? Click on the plus sign of OpenOffice.org which opens the drop down list. In the list click on 'Appearance' and to the right of the window un tick 'Text boundaries' Click 'OK' at the bottom of the window. This will close the window and remove the margin borders from the writer page. To show the margin borders again follow the above and tick the box beside 'Text boundaries' and click 'OK' at the bottom of the window. It possible to print the lines showing rows and columns on a blank spreadsheet. One way is to open a new Calc (Spreadsheet) and go into Format > Page > Sheet > Tick against Grid in the Print list and click OK. Then put a space in the top left hand cell and the bottom right hand cells of the sheet by placing the cursor in the cell and moving the space bar once or twice to give it something to print. Do a Print Preview before printing to be sure what is done is correct. Piere Omidyar had formed a sole proprietorship for his web consulting and freelancing technology work, which he named Echo Bay Technology Group. In 1995, Pierre Omidyar created Auction Web, the forerunner to eBay. The company originally operated out of Omidyar's house in San Jose, California. The company name, eBay, was arrived at by accident The company was originally known as Echo Bay Technology. In 1995, the company tried to register the domain name echobay.com; however, this domain was in use. The company shortened its domain name to eBay.com. ebay is short for echo bay and echo bay came from Echo Bay California. The site began with the listing of a single broken laser pointer. Though Pierre had intended the listing to be a test more than a serious offer to sell at auction, he was shocked when the item sold for $14.83. Pierre knew that he'd created something big as soon as he contacted the winning bidder to ask if he understood that the pointer was broken. "I'm a collector of broken laser pointers," came the reply. eBay began as an online market from which people could sell goods and services on a local or international basis. In 2010, eBay's company information describes the company as global with websites in the Asia Pacific region, Europe and North America. With 90 million worldwide users, eBay is the worlds largest online marketplace. eBay grew rapidly, branching out from collectibles into nearly every type of market. eBay's vision for success transitioned from one of commerce—buying and selling things—to one of connecting people around the world together. eBay thrived, eclipsing many of the other upstart auction sites that dotted the dot-com bubble. According to eBay, PayPal, the online banking website, became an important part of eBay. In 2002, eBay took control of PayPal. In 2009 eBay sold goods worth $60 billion. This small software application bypasses Windows search with a lightning quick interface and real-time results for all of the files and folders in your local hard drive or any subsection of it. The software doesn't do much more than search, but its efficiency, effectiveness, stability, and low system resource usage make it a keeper utility. The software is split into two main controls:- the search box and the results page. When you first run Everything, it will create an index of all the files and folders on your machine. Unless you have millions of files, the index will be created before you know it. Searching is done in real time, as you type--i.e. the search term "rad" returns 379 objects, "radio" returns 160, and "radiohead" returns 71, all instantly. The results screen can display seven different fields: Name, Path, Size, Last Write Time, Creation Time, Last Access Time, and Attributes. Sorting by any field takes a little longer than searching, but only slows down noticeably when you sort more than 1,000 results. Everything also lets users connect to HTTP, FTP, or ETP (Everything Transfer Protocol) servers to allow remote searches, but its functionality is mostly singular--searching your local PC very quickly with minimal resources, and it accomplishes that well. If you've never struggled with Windows search before, you might pass Everything by; if your computer is a disorganized mess with files all over the place, Everything might be a wonderful gift. This site - http://www.voidtools.com/faq.php give information about the programme and answers questions about Everything including Searching, Results, Customizing and Troubleshooting. Do you spend time looking at a favourite website or blog to see when something new is added? You could save this time and bother by having an RSS Feed to that site. An RSS feed is a simple method for staying informed about new content on a website. Types of content that can have RSS feeds are news items, publications, media releases, alerts and blogs. RSS is a file format that is used to let people know when a certain website or part of a website has been updated with new content. The service which alerts users to these updates is known as an RSS feed. A feed, like a website, is a file of computer code that your computer converts into something that can be read on your screen. Unlike a website, an RSS feed cannot simply be viewed in your browser window. To view an RSS feed, you will need to download an RSS reader (also called a feed reader or RSS aggregator). When loaded into an RSS reader, a feed will deliver a brief summary of each update that is made to the website it comes from, along with a link to the updated area of the website. Where can I find RSS readers? There are a large number of RSS readers (also known as feed readers or news aggregators) available to the public. Some are downloadable programs that are installed on your computer, while others are web-based services that you log in to through your web browser. Some web browsers (such as Firefox, Opera and Safari) are also capable of tracking RSS feeds. Click on frame with A in centre . This opens the Fontwork Gallery. Double Left Click on the chosen font. This will close the Fontwork Gallery window and copy 'Fontwork' to your document with green handles around it and a yellow dot. 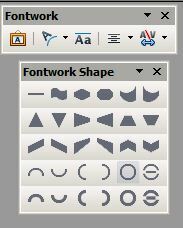 From the Fontwork Window Click on Fontwork Shape to show the drop down box of shapes. Choose the narrow circular shape (second bottom row and second from right end) by a double left click on it. The word 'Fontwork' will change shape.. Select the text in the middle by holding down the shift key and move the cursor back over the the word using the left arrow key so it is highlighted. 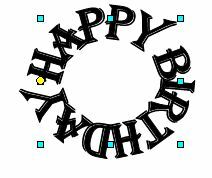 Now type in new text (Happy Birthday). Double Left click in the word Fontwork. This will change your text and the shape it is. 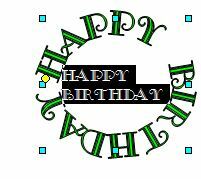 Click the text in the shape so there are the small green handles around it. Move the cursor over a green handle until the cursor changes to a double ended arrow. Move the arrow to drag out to the circle shape. With the green handles around the circle click on the text to get a cross with double ended arrows. Using these arrows with the cursor the shape and text can be moved around on the page. Invisible, Colour, Gradient, Hatching or Bitmat. Try the varitations that are here. The font style can be changed – just double click and highlight the middle text as below and change the font, size, or colour (as above). Click away from the straight text in the centre and the text will return to circle shape. To increase the gap between words (with the green handles on) hover you mouse over the yellow dot (near the centre dot on the left hand side above) and your pointer will turn into a hand. Click and drag the circle upwards slightly and that will create a bigger gap between the first and last words. Another method to give more space between words (with the text highlighted in the centre) is press the space bar to make a space before or between words. The number of letters in the text being used and the size of the circle will determine the finished size of the text. It may be a bit difficult to do some of the steps above at first attempt but persevere and experiment a little using more or less letters in the wording, add extra spaces between words, change the font being used, change colours and more. Experiment with different shapes. Have fun! Once satisfied with the circle of text it can be copied to use in a card programme (if the one you use does not have this capability), to an e mail, or included in a slide show or text document etc. If working on a spread sheet there can be advantages to have each second row shaded in a particular colour throughout the sheet. This will stay constant even if rows are deleted or added to the sheet during work on it. Select any single cell within the sheet to format it with the colour required. Next step is to give that format a name. Go to Format > Styles and Formatting > In the Styles and Formatting Window > click on the 'New style from Selection' Icon (the middle icon at the top right hand corner of the Window). Hover the cursor over the icon and the name will appear to confirm it is the right icon. In the 'Create Style' Window > Style name > insert a name of the colour to identify the background chosen > click OK. This inserts that name in the list on the Style and Formatting Window. Close the Style and Formatting Window by clicking on the 'X' in the top right hand corner. Select all cells in the spread sheet either 'Ctrl + A' or Click the blank cell in the top left hand corner of the spread sheet at the intersection of the row and line number. Now apply conditional formatting to the entire sheet. Go to Format > Conditional Formatting. In the Conditional Formatting Window > tick the Condition 1 box > in the spin box below that change to 'Formula is' In the box opposite this type in formula “mod(row()+1;2)=1” without the inverted commas. In the Cell Style from the drop down choose the colour there that was chosen previously for the spreadsheet. Click OK.
Take the highlighting off the spread sheet by clicking somewhere within the spreadsheet and every second row will be the chosen colour. If intending to use this regularly on new spreadsheets save as a Template. There are options to font display in Open Office that make it more user friendly. Generally the Formatting Toolbar that shows the font name and font size boxes will be displayed in Open Office Writer and Calc documents. If not showing, click on the View in the Headings and the drop down will show Toolbars. The side bar menu shows the list of tools bars that can be opened or closed by ticking or removing the tick. One of these is the Formatting Toolbar. With the Formatting Toolbar open the Font Name box is visible with an arrow to show a drop down list of fonts. In Tools > Options > OpenOffice.org > View if you have ticked the Font History field and click OK the last five font names that have been selected for the document you are working on are shown in the top part of the combo box. This is a useful option if typing a document that contains a number of changes in fonts being used. Another option in the Tools > Options > OpenOffice.org > View is to have the names of the fonts formatted in their respective font if you tick in the Preview in Fonts list and click OK. This makes the choice of font to be used easier than if all the fonts are listed in the same default font. When the current document is closed the font history is cleared from the drop down list. By ticking the drop down arrow a limited number of fonts is shown. If the first letter of the font being looked for is typed in the name box the list will immediately go to the block of fonts beginning with that name to make selection quicker than scrolling down through all the listed fonts. Any font changes apply to the selected text or word in which the cursor is positioned. If no text has been selected, the font applies to the next text typed. If working in a spreadsheet with more rows of information than can be viewed on one sheet, it is possible to keep the headings in view as you scroll down the sheet to view or enter more rows of information. Enter the headings of the columns in Row 1 Columns A, B, C etc. (EG – Date, Day, Event, etc) These are called labels. From now on however many rows of the spreadsheet are used the 'labels' will remain visible at the top of the sheets to be a guide for reading or entering more information in the sheet irrespective of the number of rows used in the spreadsheet. In Open Office Writer it is possible to insert a number of lines of equal length for part of the way across a page which is sometimes a requirement. Open an Open Office Writer document – Go to > Insert > Table (one line and one column) > Click > OK. This will put a table into your document. Adjust the table to the size of the line length required by hovering the cursor over the end border line to get the double ended arrows and then move the mouse to adjust the size to what is required and move to position required. at the beginning of a line and then press Enter. In Writer documents this will insert a horizontal line across the page between the set margins. Each key will give a different line style. More than one line can be entered to within the frame by pressing enter after the first line is entered. The border will still appear to be around the table. To remove > go to Table and from the drop down > click Table Properties > Table Format > Borders Tab > Style > Choose None > click far left square under Default > Click OK. Check by doing Print Preview and the table borders will not be visible or be printed. The same can be achieved with using Insert Frame and adjusting procedures used for frames to insert lines across frame and adding the colour desired to the line/s. To remove the effect once it is present - > Right click on the frame so the green handles are around the frame > Click > Delete key. This will remove the frame and the lines that were inserted. In Open Office Writer the colour of the line may be changed. Go to > Format > Paragraph > Borders > Line > Colour and select the desired colour from the drop down list. Alternately right click and from the list > Paragraph > Borders > Line > Colour and select the desired colour from the drop down list and click OK.
at the beginning of a line and then press Enter. This will insert a horizontal line across the page between the set margins. Each key will give a different line style. Right-click in the paragraph before the line and select Paragraph... | Borders. Under “Borders”click in the leftmost small box, to remove all borders or in the Style List scroll to the top of the list to left click on 'none'. Press OK. The colour of the line may be changed. Writer sees the line as a border attached to and part of the preceding paragraph. With the cursor in the preceding paragraph (or just above the line), go to > Format > Paragraph > Borders > Line > Colour and select the desired colour from the drop down list an click OK. Alternately right click and from the list > Paragraph > Borders > Line > Colour - select the desired colour from the drop down list and click OK.
To increase or decrease the font size for text in a Microsoft Word Document, select the text and press Control (Ctrl) plus the key ' ] ' to increase, or Control (Ctrl) plus the key ' [ ' to decrease the font size. When you select text with multiple font sizes, all sizes are altered by the same amount. The shift key and the Caps Lock keys on the key board allow the changing of case of text as a document is being typed. On an already typed piece of text there are other options. MS Word – In an MS Word document a quick way to change text from lower case to capitals or first letter capital is to use the combination SHIFT and F3. With a word or words or a block of text on a page highlighted, each time you hit the SHIFT followed by the F3 key, the text formation will cycle through Lowercase, Capitals and then First Letter Capital. There is also a way to make changes under Format > Change Case which opens a Change Case Window with options there with radio buttons for – Sentence case, lowercase, UPPERCASE, Title Case, and tOGGLE cASE. Open Office – Open Office has a capability through Format > Change Case. Here the options are – Sentence Case, lower case, UPPER CASE, Capitalize every word, tOGGLE cASE. If Open Office is ‘Enabled for Asian Languages’ there will be additional options available. Icons for changes to Uppercase and Lowercase can be added to visible buttons on the Formatting tool bar to be used on highlighted text. This can be used both in Open Office Writer and Calc documents. 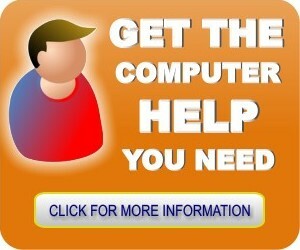 The help files provided by Windows and the various software packages used contain a wealth of information. The Start Menu of the various versions of Windows all contain a Help and Support or similarly named items about the programme itself. Each programme installed on the computer will have the word ‘Help’ in the menu list generally at the right hand end of the list at the top of a page of an opened programme. Click on the word Help and a drop down list will have words there to click on to see contents of the Help file for the particular programme. This page may allow choice of searching through tabs such as ‘Contents’ ‘Index’ ‘Find’ and in Open Office, provision for ‘Bookmarks’. (For information on using Bookmarks right click on the word Bookmark and press the F1 Key). If the first attempt does not bring the exact subject help is needed on, try using a different word or two to cover what you are searching for. If the help within the programme does not give the information required then the Internet will have more than enough help by doing a search by using one of the search engines available – Google – being a particular favourite or use others such as Yahoo, Amazon, Answers, Wikipedia etc. Currently there are many sites which will offer YouTube videos to show step by step actions. When using the search engine of your choice look around and search for 'Videos' if you like to follow screen shots of 'how to'. Remember that the first video you watch may not be the easiest to follow so look at further videos. Check also on how long ago the video was made as this may be relevant to the version of the programme being used. 1. Choose Tools - Options - Load/Save – General. The backup copy has the same name as the document, but the extension is .BAK. If the backup folder already contains such a file, it will be overwritten without warning. 2. 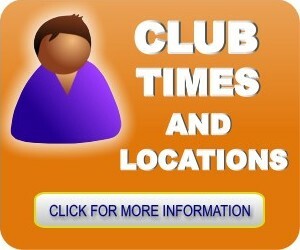 Mark Save AutoRecovery information every and select the time interval. This command saves the information necessary to restore the current document in case of a crash. Additionally, in case of a crash OpenOffice.org tries automatically to save AutoRecovery information for all open documents, if possible. If the need arises to recover a file use the path set as above which will take you to the ….BAK file. Open Office Paste command assumes you want to keep the characteristics of the copied text in the new place. Paste Special opens a Paste Special window which gives selections such as Open Office Writer, Formatted test (RFT) HTML (Hyper Text Markup Language), Bitmap, GDI Metafile etc depending on where the copy came from. Select one of these and click OK.
Alternatively there is an icon on the task bar for the Paste command. There is a down arrow on the right of this icon. Clicking on this arrow will give the Paste Special options the same as if the route > Edit > Paste Special was taken. A click on the format required will paste that format to the new place. This allows the user to use the icon drop down in preference to going to > Edit > Paste Special which brings up a Paste Special Window from which to select the format required and then clicking on OK.
You can set the default font in Tools > Options > Text Document > Basic Fonts, but that doesn't change the size of the font. To change the size of the default font as well as the font itself, make the change in the default paragraph style. Then make the document into a template and set it as the default template. 1. Open a blank document. 2. (Optional) Use Tools > Options > Text Document > Basic Fonts. Select the font from the drop-down lists. Click OK to save. 3. Press F11 to open the Styles and Formatting window. Click the Paragraph Styles icon. Right-click on Default and choose Modify. On the Font tab, set the required typeface and size. Click OK to save. 4. To save this document as a template, use File > Templates > Save. Give the template a name and save it in the Default folder. (You can put it anywhere you like, but that makes it easy to find again.) Click OK.
5. To make this template the default template, use File > Templates > Organize. Select the template you just created, then click Commands > Set As Default Template. Now any text documents you create with File > New (or the New icon) will have the typeface and size you want. You can also set margins, spacing, paragraph spacing, printer setup in the default template. If you want different default fonts or sizes for different types of documents, you can set up several templates and use File > New > Templates and Documents (instead of File > New) to choose one when starting a new document.